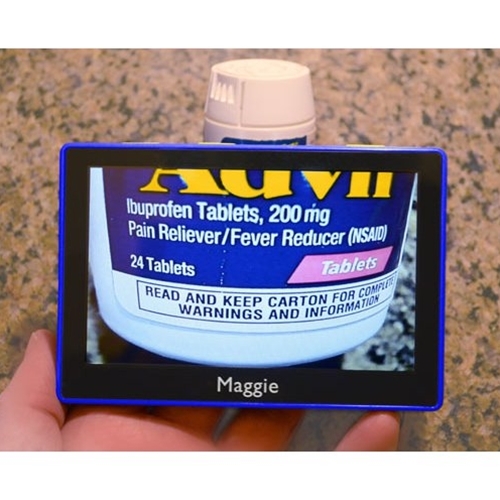 Maggie Portable Electronic Magnifier from HealthyKin.com is a large screen, ultra-light weight, portable electronic magnifier for anyone who wishes to see something more clearly. 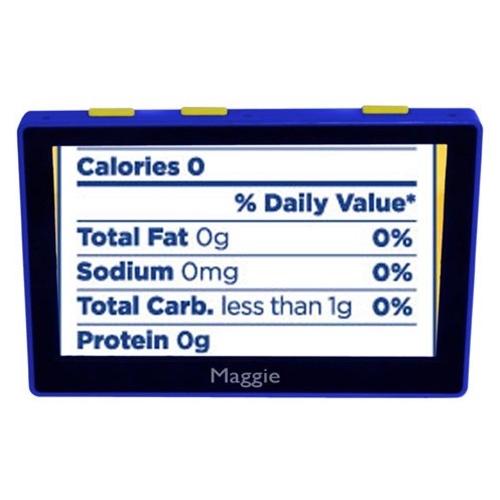 Even with it's large 5" hi-contrast LCD screen, the Maggie can be slipped in a shirt pocket or a small purse. With 4 hours of battery time, you could find yourself checking or reading things for days without needing to re-charge. When it is time to re-charge, use any wall socket or even a computer, notebook, netbook or anything else with a USB port. A large red icon will show you when it is time to charge and a large green icon (slowly and gently flashing) will show you when the Maggie is charging. With two bright white LEDs you can see to read the menu in a dimly lit restaurant or identify your keys in total darkness. Additionally, and especially for those with Macular Degeneration, the Maggie mode button provides white text on a black background for reduced glare.